Retractable patio awnings are a perfect way to shade your patio. Retractable awnings come out when the sun is out and back in it's place when you don't need it. It's the perfect way to get sun or shade whenever you want. Below are examples of retractable awnings. Visit our contractors page if you need help finding a local contractor to assist with the installation. The Motorized Pro retractable patio awning instantly creates shade, protection and comfort, anytime you want. With a touch of a button, the retractable patio awing can make your deck as much as 20 degrees cooler, while guarding you, your family and guests from harmful UV rays. 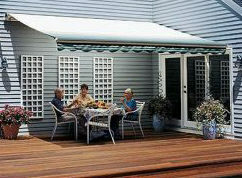 This retractable patio awning can also lower your home's air conditioning bill by shading windows from direct sunlight. This deck awning fits under eaves and overhangs as low as 7' 6" and extends out 10' 2" for instant shade. Add some shade and a great new look to your deck or patio with this King Canopy retractable awning. Retractable patio awnings are manufactured by several different companies and can be either manual or motorized. Visit the SunSetter awning page and the motorized awning page for more information about this type of patio cover. Not sure just what a retractable patio awning is, or how to measure for one? This video should help. (ARA) - Just about every deck and patio owner has encountered these situations: You want to relax outdoors, but the sun gets so hot it drives you off your deck. Or a passing shower ruins your outdoor entertainment plans with guests. Or you worry -- quite correctly -- about the harmful effects of ultraviolet (UV) rays on your family. What's the solution? For more and more homeowners, the answer is a retractable awning. Retractable awnings let homeowners outsmart the weather on their own terms. When passing showers threaten, or when the sun gets hot, they unroll the awning for near-instant protection and shade; lab tests show that it can be as much as 20 degrees cooler under an awning's canopy. When they want to enjoy the sunshine, they roll the awning back inconspicuously against the house. Awnings also offer other benefits that many homeowners appreciate. Because they prevent the sun from shining through windows and sliding glass doors, they can keep temperatures inside your house cooler as well, which saves on air-conditioning costs. They can help prevent carpets and furniture from fading in sunlight. Awnings also provide a sheltered place for children and pets to play, shielded from direct sun. Some of today's awnings also offer accessories that can greatly increase the versatility and usefulness owners get from their decks or patios. Screen room options easily turn an awning into a virtually bug-free "outdoor room," side screening cuts down on wind and mist coming under the sides of awnings, and patio lights let people enjoy their decks evenings and nights. Robust Growth in Awning Usage Nationwide -- Despite Some Myths . . . With the advantages awnings offer, why isn't there an awning on nearly every deck or patio? "I think the main reason is a misconception about cost," says Jonathan Hershberg, president of SunSetter Products, the largest manufacturer of home awnings in the United States. "People seem to think that a good awning must cost thousands of dollars, but in fact you can get a top-of-the-line manually-operated model for just a few hundred dollars, and an unsurpassed quality motorized awning for not much more," he adds. "Instead," says Hershberg, "people go out and buy a patio umbrella set, only to find that whenever the sun shines or the rain falls, there's not enough room under the typical umbrella for everyone to keep from getting sunburned or wet. In contrast, there's more than enough space under an awning. You can get an awning that’s up to 10 feet by 20 feet. That's a lot of shade and protection." "Homeowners also think that they can't install an awning under low eaves or overhangs, such as those on ranch-style homes or additions," Hershberg continues, "but, in the case of our awnings, it takes less than seven feet of vertical space under an overhang to be able to fit the awning." Today's awnings come in two basic types: manually-operated models which are opened by hand and motorized models which operate by electricity. Each offers its own advantages. SunSetter's manually-operated models, for example, are designed so that any adult can open and close them easily, without any tools, in just a minute or so. Benefits include low-cost affordability, easy adaptability to almost any deck or patio, and support arms that can be angled back against the house or set vertically on the deck or patio floor. These arms provide extra support and stability, and increase the awning's versatility by making the attachment of certain options available. Motorized retractable patio awnings have retracting "arms" instead of vertical supports. These arms are operated by cable and an electric motor hidden inside the awning, which opens and closes the awning at the touch of a wall-mounted switch. SunSetter's motorized model also offers a remote control option that lets you open the awning from anywhere, even from inside your home. Motorized awnings are the ultimate in convenience, with classic simplicity and beauty. Some awnings do not have to be taken down at the end of the summer. They can remain retracted against the house all winter long, yet they can be removed and taken with you if you move to a new home. Awnings such as the SunSetter can be installed quickly and easily over any kind of siding including vinyl siding, brick, and stucco, and on the underside of soffets and overhangs. They can also be mounted on fences, garages, and other outbuildings, which makes them wonderfully suitable for use by pools and near permanent barbecue terraces. "I'd look closely at the awning fabric," says Jonathan Hershberg. "Many fabrics are not 100 percent waterproof, which can let a fine mist through during a shower. Don't assume that all fabrics block UV rays. Get one that blocks out 99 percent of all ultraviolet radiation. Coated fabrics are also easier to keep clean, and tend to hold their color far longer without fading." "One note about fabric color that most people don't realize," adds Hershberg, "is that awning fabric comes in all sorts of color options, but awnings that are light colored, or go from stripes to a light solid are generally cooler and more efficient than solid, dark colors. Dark colors tend to absorb heat and can defeat the purpose of having an awning for cool shade." Compare and Save. The Internet is a great tool to help compare brands, prices, and product options. Some companies sell awnings directly from their factory which can translate into big savings. Tip: Evaluate similar options to ensure the best cost comparison. Quality aluminum components, and baked enamel finishes. These help prevent rust, and eliminate painting and maintenance. Electric motors. If you're shopping for an electric powered awning, Somfy motors are internationally recognized as the best in the industry. Warranty and other indications of quality. A good warranty is generally an indication of the quality and service you can expect from your awning. For example, SunSetter offers a five-year limited warranty. SunSetter Awnings also have been awarded the Good Housekeeping Seal of Approval, the only awnings to have earned this designation. Home Trial. The highest quality awnings come with a no-risk money-back home trial period, some as long as three months. This usually indicates a manufacturer that stands behind the design and quality of their product. Strong customer service after you buy. If you ever have questions after you buy an awning, customer service assistance via a toll-free phone number and Web and e-mail support is a great peace of mind. If you are installing an awning yourself, a toll-free installation hotline is a plus. "A retractable patio awning is a very low cost investment that provides big returns in comfort and enjoyment," says Hershberg. "It's almost like getting an extra room on your house. It allows people to expand their living space, and at the same time, adds value to their home."